The iHeart Radio/KISS FM Jingle Ball kicked off in Dallas last night at American Airlines Center to a huge turn out. This was great news not only for the artists performing, but for the Kidd’s Kids organization started by the late Kidd Kraddick. One dollar from every ticket sale went to the organization and from the looks of things that was a very nice-sized contribution. As holiday parties go it was a good way to start off the season. And it was a huge party. With so many artists scheduled to perform, the set times (and changes) were incredibly short – between 15 to 20 minutes only and set change times of only 5 minutes. Normally one might expect some glitches with such a tight schedule on the first show, but the Jingle Ball crew had things down to an art. With the help of a revolving stage everything ran on time and appeared to go flawlessly. Jason Derulo kicked the night off with what seemed to be a medley of songs, including his hit “Talk Dirty” and some amazing dance moves. He got the crowd going right off the bat and set the tone for the night. In what seemed like just a few minutes he was off the stage and out came Fifth Harmony. Originally formed on the second season of The X Factor, their EP Better Together released in October of this year and has gotten them a great deal of attention. Though I felt they were still getting used to playing events this big, the girls did a great job and are truly impressive with their ability to harmonize. The girls headed off, the stage spun around, and the crowd let out an ear splitting scream as Robin Thicke appeared in a suit and sunglasses and got right to business. Singing songs off his newest album Blurred Lines, he went from sauntering across the stage, to playing piano, to singing on top of the piano and the crowd loved every moment. And the intensity in the room didn’t let up when Thicke was done because up next was OneRepublic. With such sort sets the bands were hard pressed to get songs in and focused on their top hits and OneRepublic was no different. Opening with “Good Life” and moving to a beautiful rendition of “Apologize” they hit all the songs you know and love. Another quick set change and another artist and I had to do a double take. I’ll admit that pop isn’t the genre of music I listen to most and while this next performer’s name rang a bell I couldn’t place it. But when Ariana Grande steppe out on stage I realized why – it was Cat from Nickelodeon TV’s show Victorious. Is it sad when the first thing you thing of on hearing of two successful singers is the shows they were in that your kids watched for ages? Well even if that was how I originally knew Ariana Grande, she definitely impressed me with her singing. She truly does have a beautiful voice and though she was obviously nervous (this was the first time at a show like this) she did a great job showcasing her talent with songs like “Honeymoon Ave” (done as an acoustic) and her remix of “Last Christmas”. Enrique Iglesias. Just the name makes women swoon. 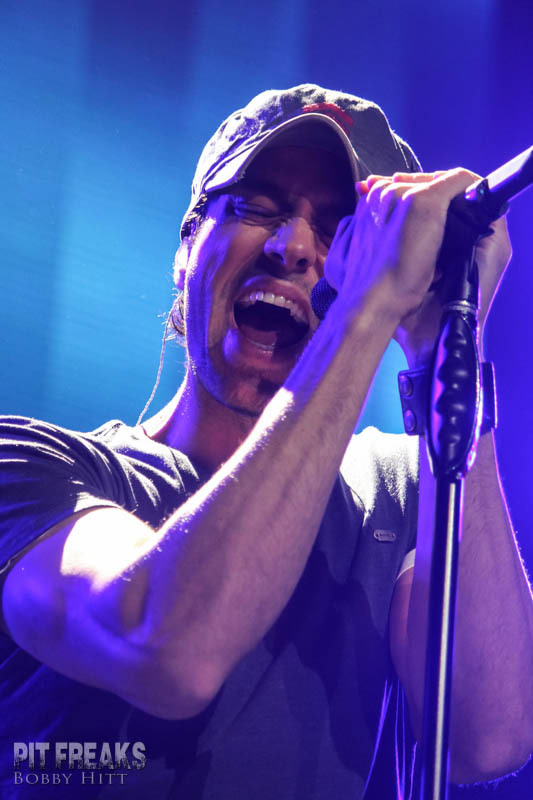 Even with a 20 minutes set Enrique showed all the younger artists just how to work a crowd and crammed in all your favorite parts of a concert into his small time slot. Between going out into the crowd for a quick hello, to dropping huge balloons with his initials to be batted around by the crowd (and caught and kept by many) to shooting off a little bit of pyro at the end, Iglesias nearly blew the roof off the AAC. And it appeared that the next artist up was going to keep with the ‘get the crowd involved’ theme. Flo Rida brought out an entourage with him, including a Santa Claus who went out into the crowd and chose several women to come up and dance on stage to Flo Rida’s hit “Low”. He also headed out into the crowd during “Whistle”, riding on the shoulders of one of his entourage and the fans rushed through the isles to get close. Hometown girl Selena Gomez was met with a huge welcome. After a successful gig signing at the Thanksgiving Day half time show for the Dallas Cowboys, Selena donned a bobbed wig and hit the stage at AAC. Like the other artists she focused on songs off her latest album, including “Birthday”, “Come and Get It” and “Undercover”. And just when I didn’t think the screaming could get any louder another native Texan took the stage. YouTube sensation Austin Mahone reminded me of Justin Bieber when he was starting out. The kid has some talent and nice dance moves and certainly has the hearts of the teenage girls. With a debut album about to be released he’s sure to be packing big venues all on his own in no time. The only glitch in the system last night came during the very short set by yet another native Texan, SoMo. Sadly I didn’t catch much of what he was singing as the audio was messed up and we couldn’t hear him until a little over half way through but from what I did catch he sounds like someone I would like to hear more of. Last but not least was Miami recording artist Pitbull. Keeping with the trend of playing crowd favorites, like “I Know You Want Me”, he rounded out an amazing and fast paced night that was a fantastic kick off to the 2013 Jingle Ball tour. If you get the chance to check out any of these artists, definitely do. And if you’re a parent and you’re going to anything with Austin Mahone – bring earplugs. Teenage girls screams have a pitch all their own.